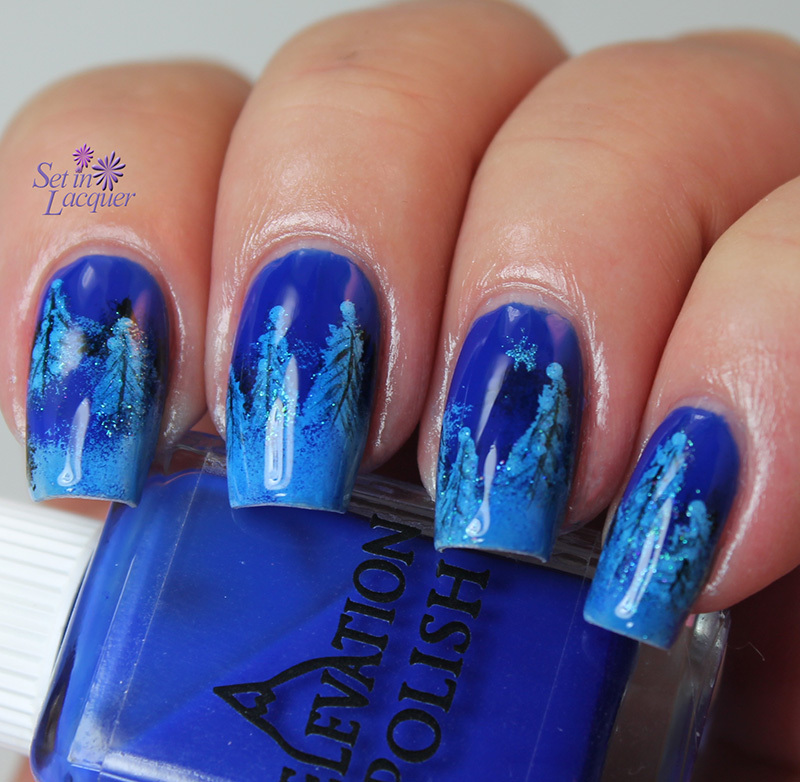 Today's post is some fun magical nail art. There's something awe inspiring about seeing trees on a mountainside with the night's glow illuminating them. So that's the illusion I tried to create. I started with two coats of Elevation Polish "Pic de Sotllo." 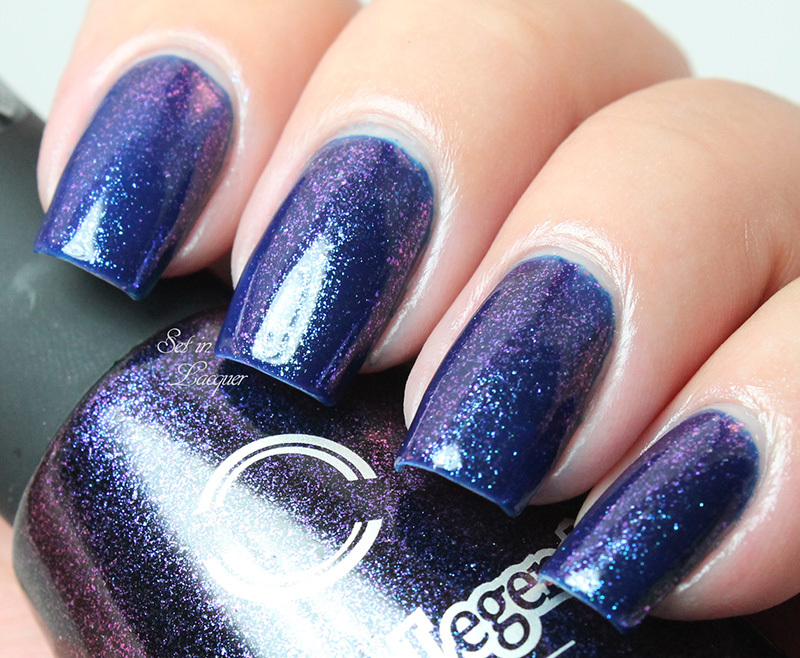 This deep, royal blue polish was perfect for the base color. Then I added some "snow banks" by sponging on white and gray acrylic paint. I also sponged on some black to give it a bit of depth. I sponged on white trees and then added some details with black acrylic paint. I painted over the trees with Dance Legend 605 top coat. It was just the right amount of sparkle. Then I added a few dots with white paint to add some snowy illusions. I topped it all off with a coat of Esmaltes da Kelly sheer blue jelly polish. I added a top coat of HK Girl and I had the look I was going for. Have you added sheer jelly polish over nail art? It gives it a completely different look. Some of these polishes were provided for an honest review. All opinions are my own. Please note that computer monitors may display colors differently. It's been a week of holiday nail art so far. Why am I posting it so early? Basically to give you ideas for quick and easy nail art. If you're like me, you see something and want to recreate it... but with your own twist. 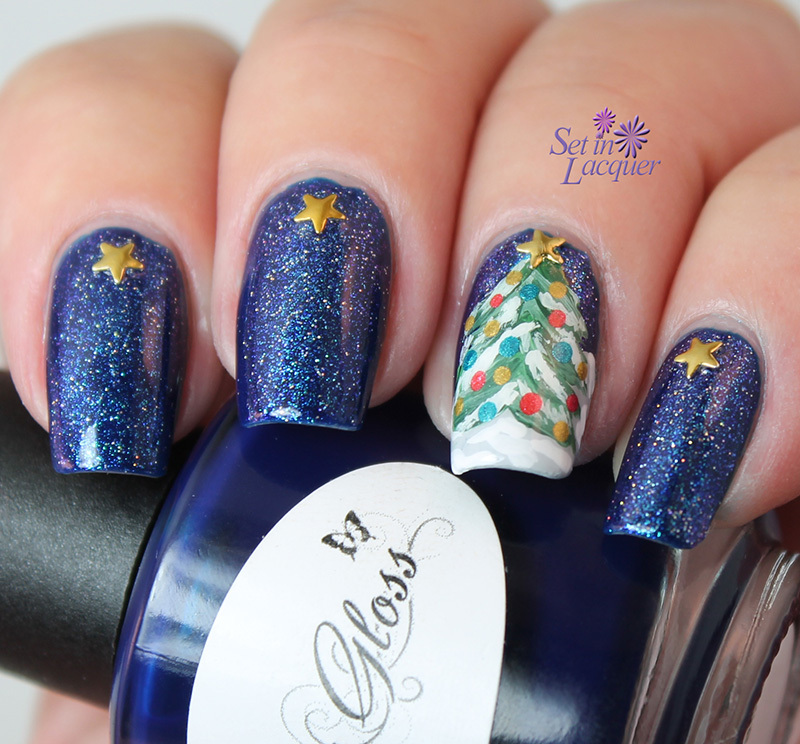 So for today's holiday nail art I created a easy, yet almost three-dimensional Christmas tree on an almost starlit base. I started out with two coats of Fancy Gloss My Sailor. 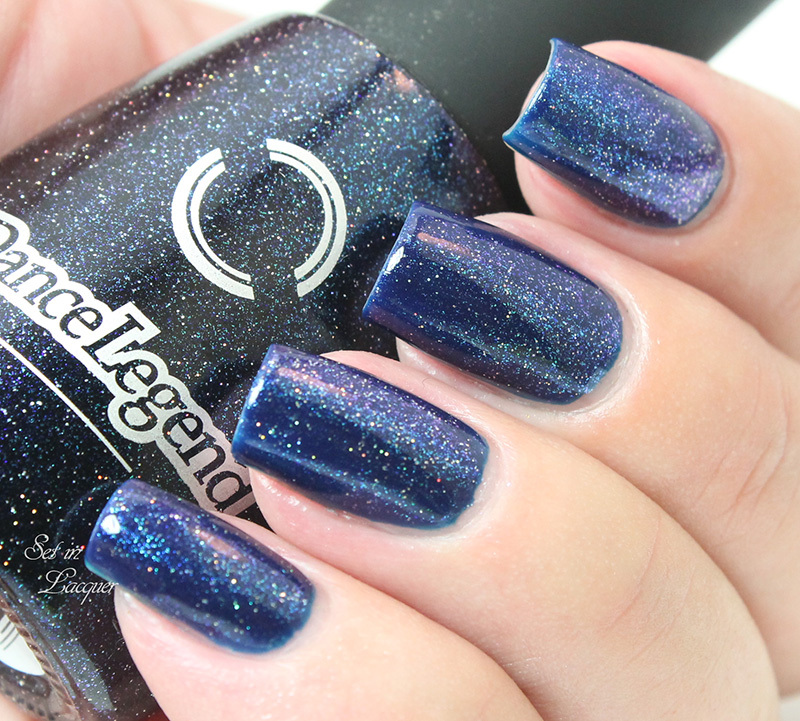 This shade has become my "go to blue"polish. 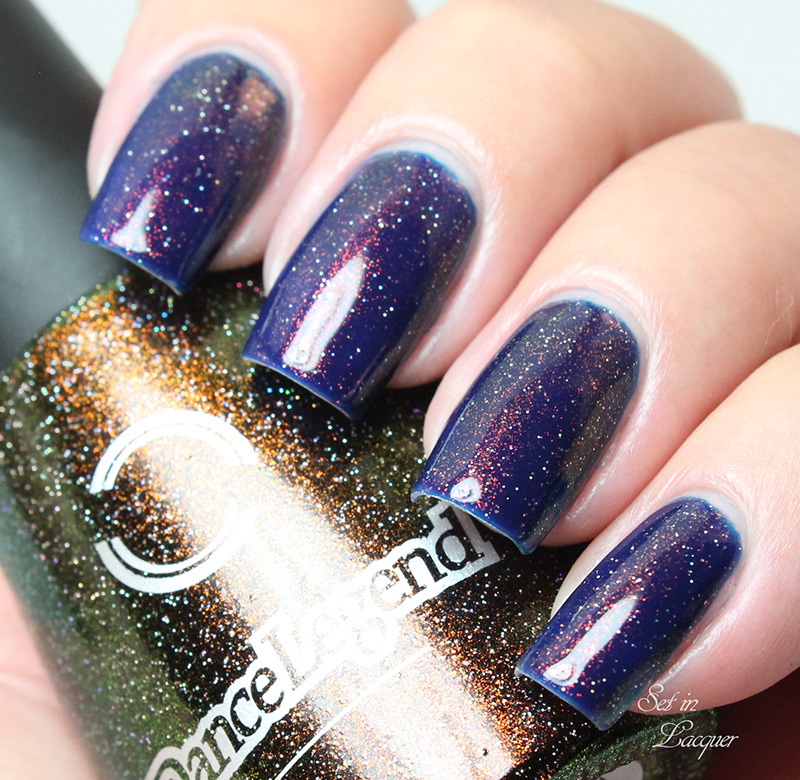 Then I added a coat of Dance Legend 607 top coat to add a sparkle that would appear as a quiet, starry night. I used a acrylic paints to add the base of snow and the tree. Gray paint was added first. Then, using varying shades of greens I created the tree. I added some white paint for the flocking effect and different colors of paint for the decorations. 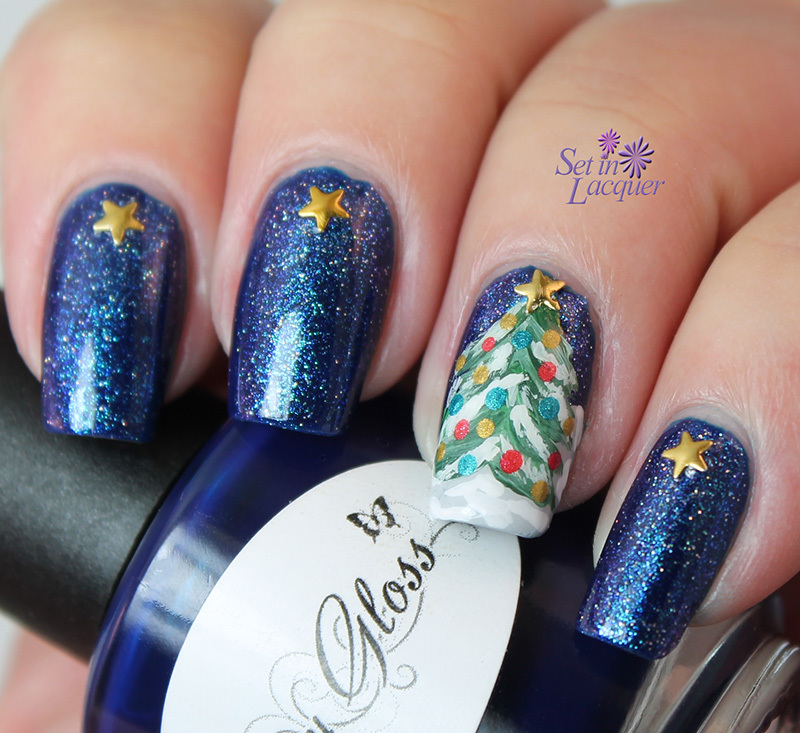 I had some metal star-shaped studs so they were perfect for the topper on the tree and as an accent on the other nails. I topped it off with a coat of HK Girl to seal in the design and add lots of glossy shine. Who knows what I will come up with for the next holiday nail art. Sometimes it is hard to come up with something that I a.) actually think I can pull off and b.) is remotely creative. 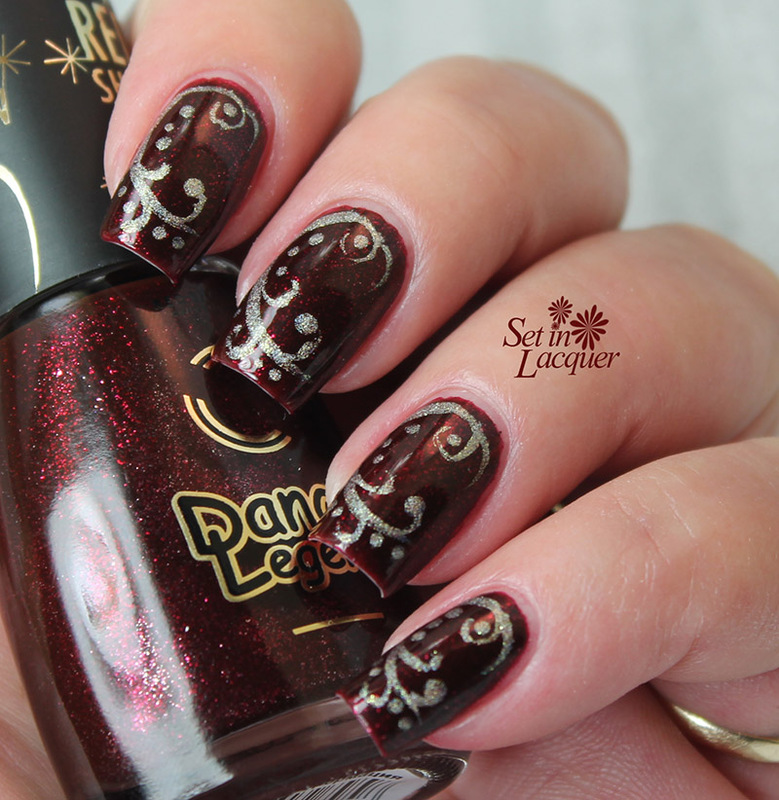 In the meantime, feel free to post your holiday inspired nails on the Set in Lacquer Facebook page. These polishes were previously sent to me for an honest review. All opinions are my own. Please note that computer monitors may display colors differently. I recently realized I haven't picked up my stamper in almost a year. So I decided to reacquaint myself with it. Needless to say, I am out of practice, so I decided to create a "stampwich" with jelly polishes. Using this technique is easy and it hides most imperfections. I recently purchased some of the Colors by Llarowe jelly polishes; so of course, I had to try one of them. I chose Grape Juice. 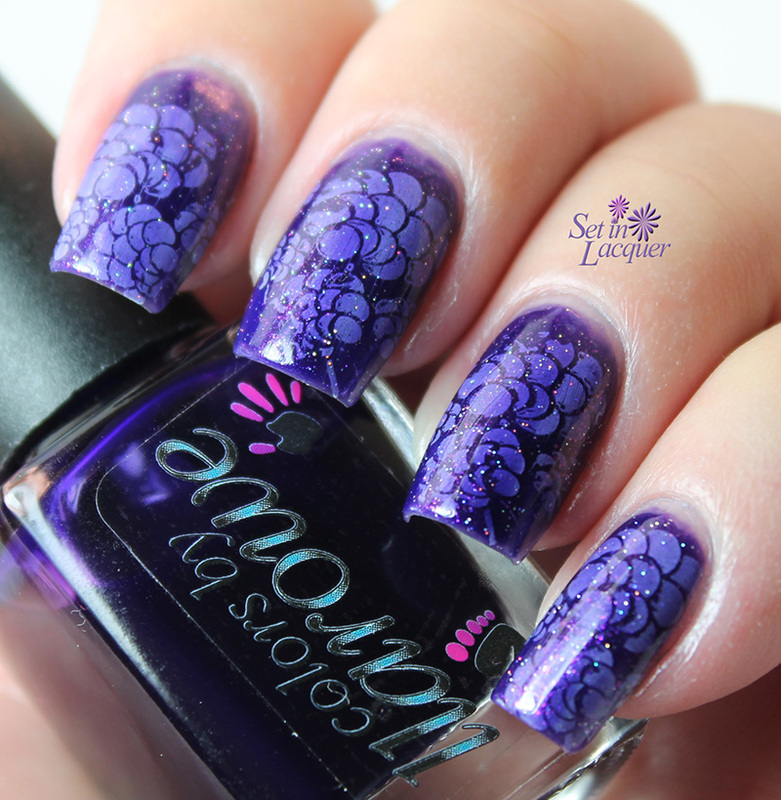 Grape Juice is a deep purple jelly polish. Jelly polishes require a build up of layers to get them to an opaque state. 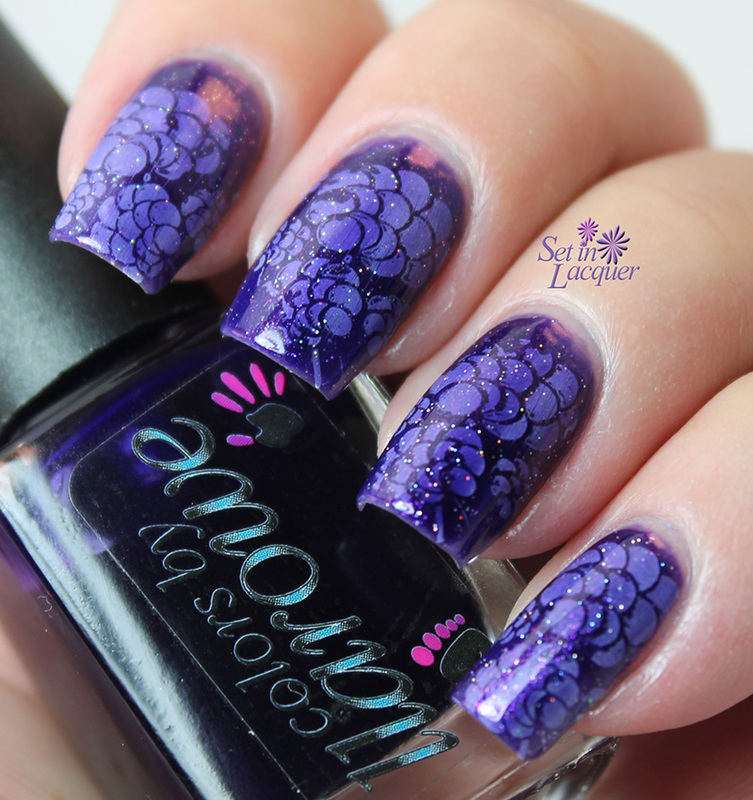 They are perfect for stampwiches, pond manis and other nail art. I started with two coats of Grape Jelly and then stamped with a white polish. For the stamp, I used an image from the Bundlemonster 204 plate. 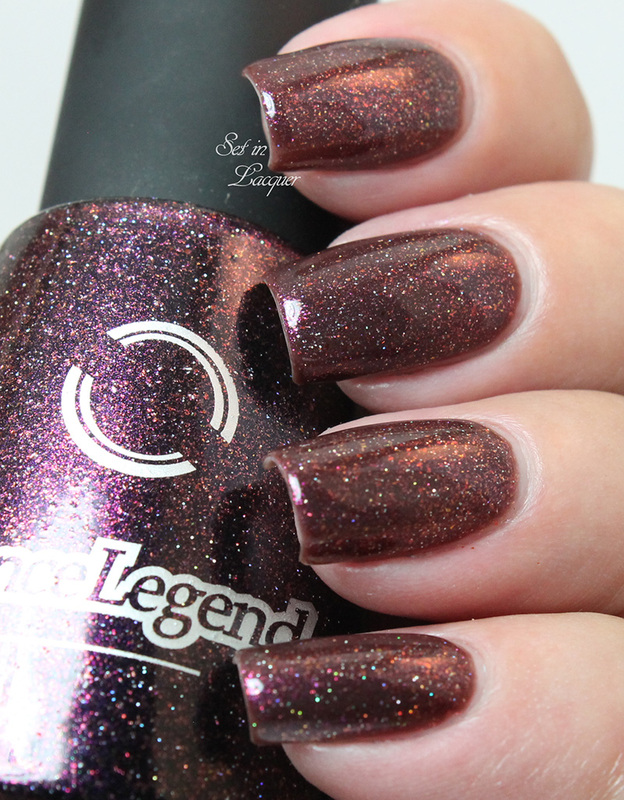 Then I applied another coat of Grape Jelly and topped it off with Dance Legend 600 to give it sparkle. I may have to try this more often. So, I guess I will be practicing with stamping a little more often. 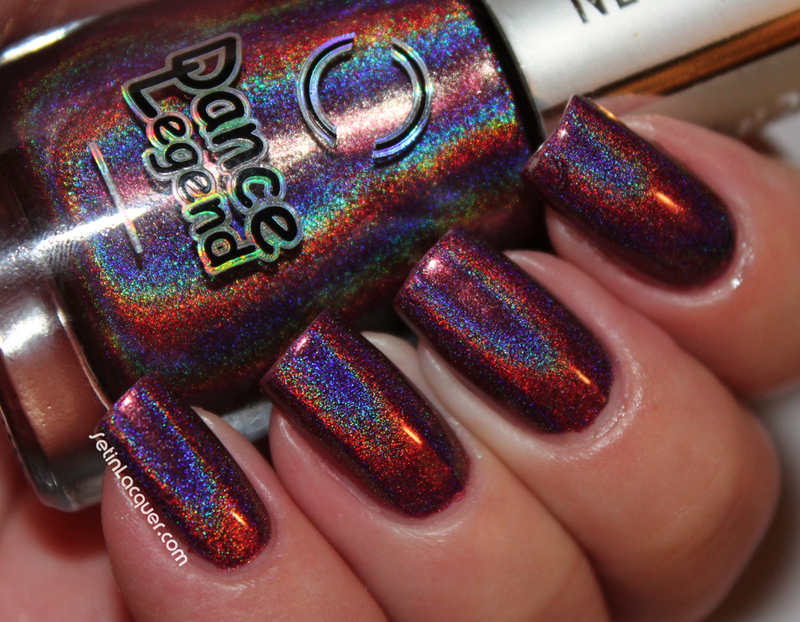 I have some amazing Dance Legend top coats to share with you today. 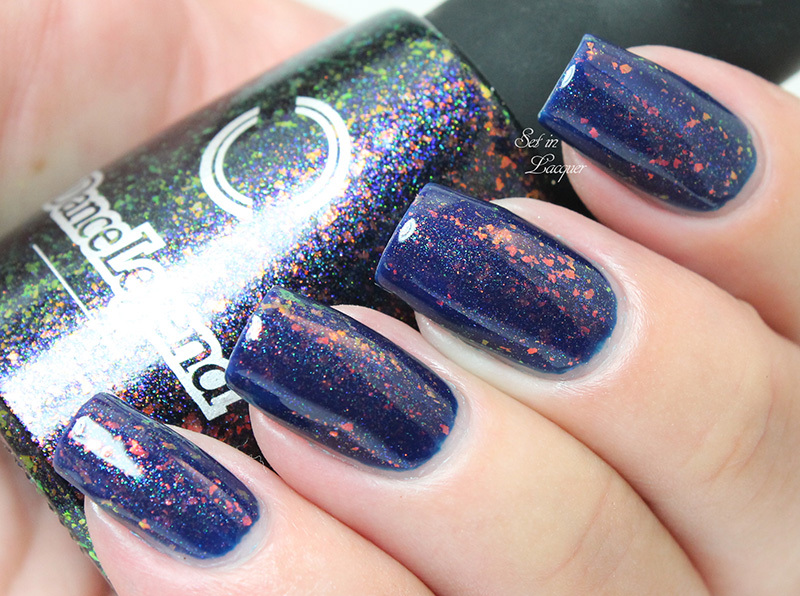 I love these type of top coats. They add so many possibilities. Want to spruce up an existing manicure? How about adding an endless supply of colors with a top coat? Well, that's what these do and they work especially well over dark polishes. I posted three of these toppers yesterday. Make sure you check those out as well. 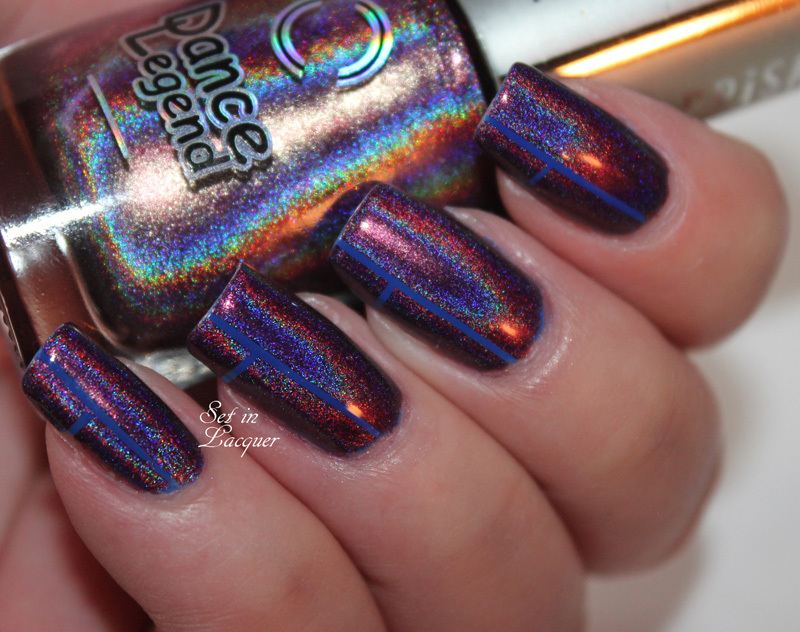 Let's take a look at these mesmerizing, holographic-infused top coats. 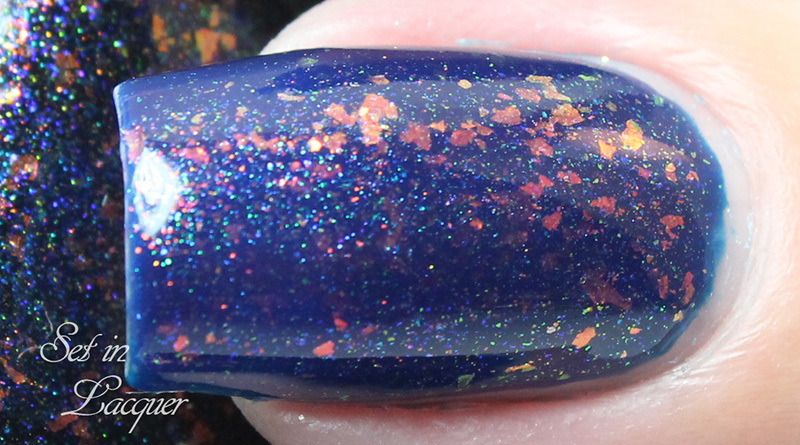 I am showing all of the polishes over Fancy Gloss "My Sailor." 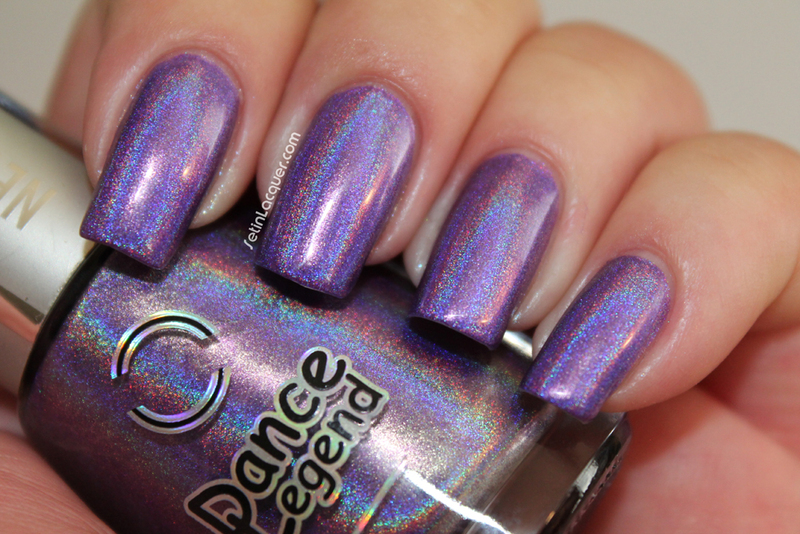 Dance Legend 600 top coat has an stunning purple sheen and an amazing holographic shimmer. I applied it over Fancy Gloss My Sailor. 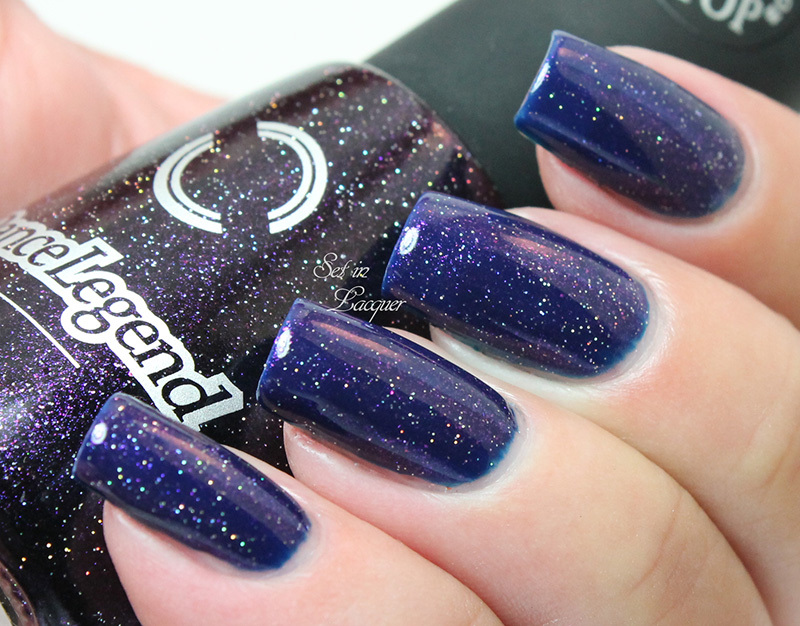 My Sailor is an amazing navy blue creme polish. I had no application issues with either of these polishes. And look at that amazing shimmer! This is two coats of My Sailor and one coat of Dance Legend 600. 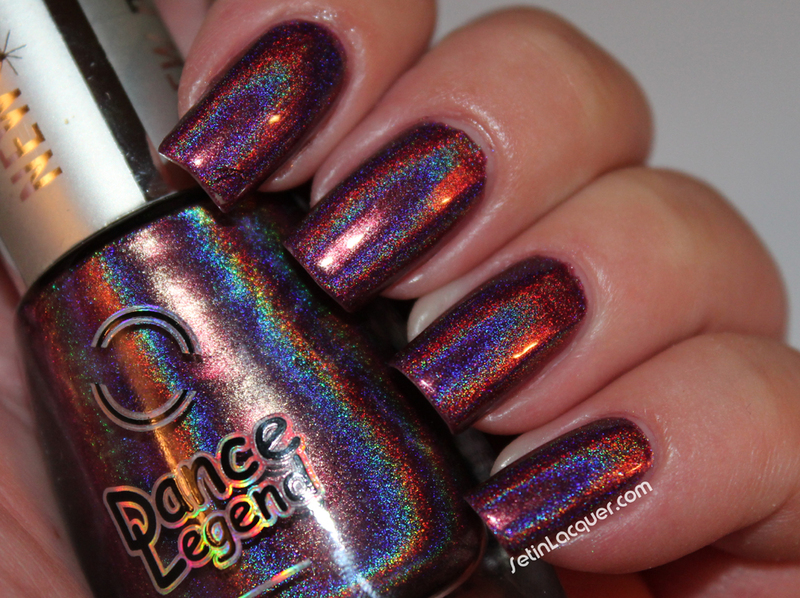 Dance Legend 602 top coat has a gorgeous subtle red sheen and an amazing holographic shimmer. The red highlights in it almost remind me of Fantasy Fire. I applied it over Fancy Gloss My Sailor. I had no application issues with either of these polishes. 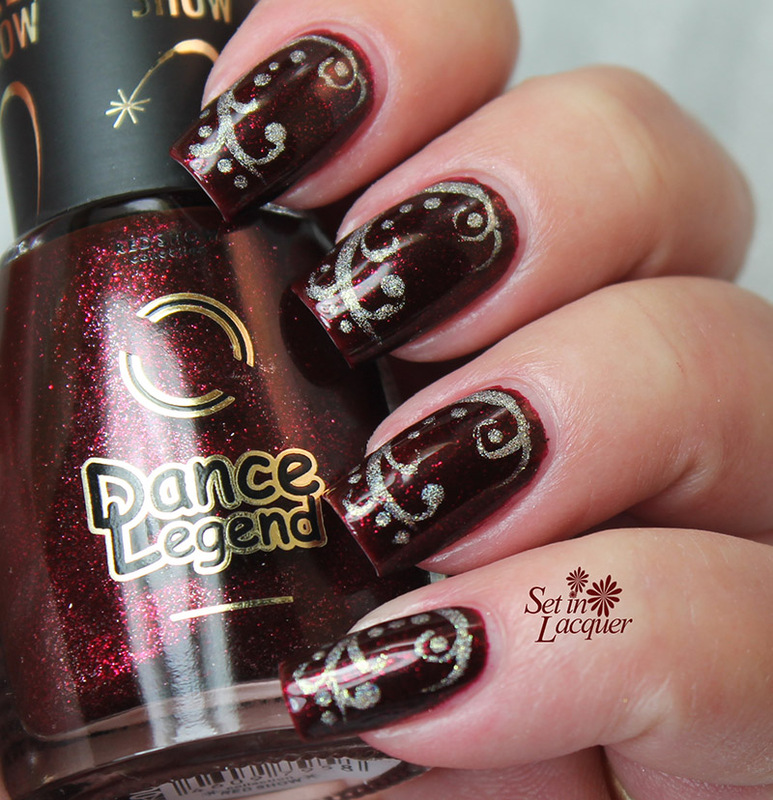 That amazing red shimmer definitely makes this one an eye-catcher! This is two coats of My Sailor and one coat of Dance Legend 602. 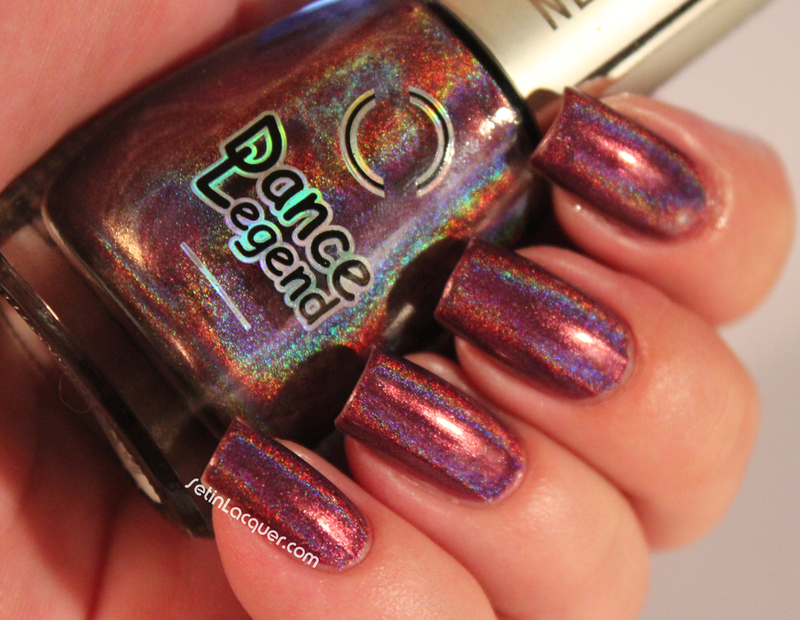 Dance Legend 604 top coat has a subtle, but stunning holographic shimmer with gorgeous flakies to set it off. 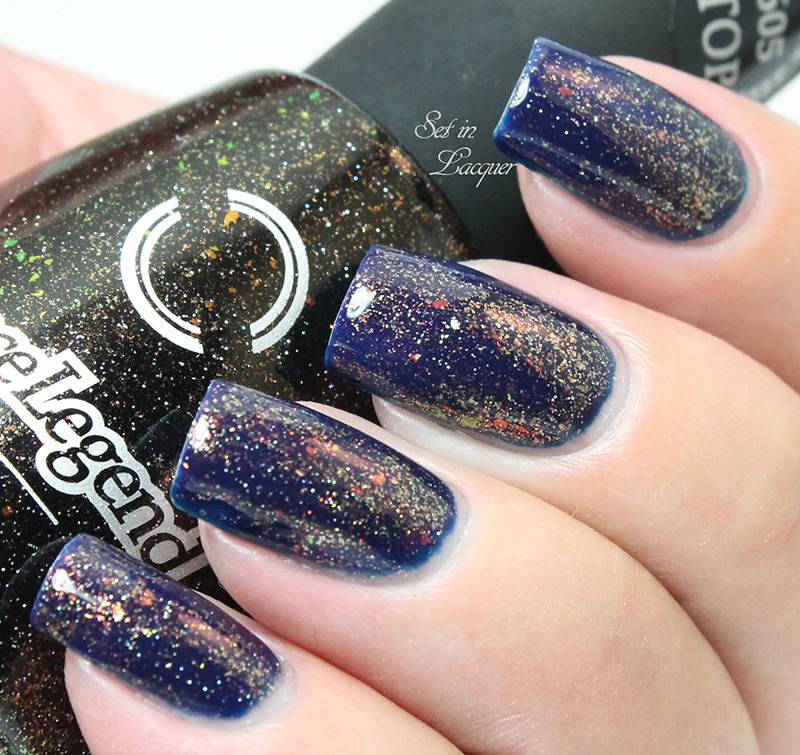 If you love flakies, this one is definitely for you. 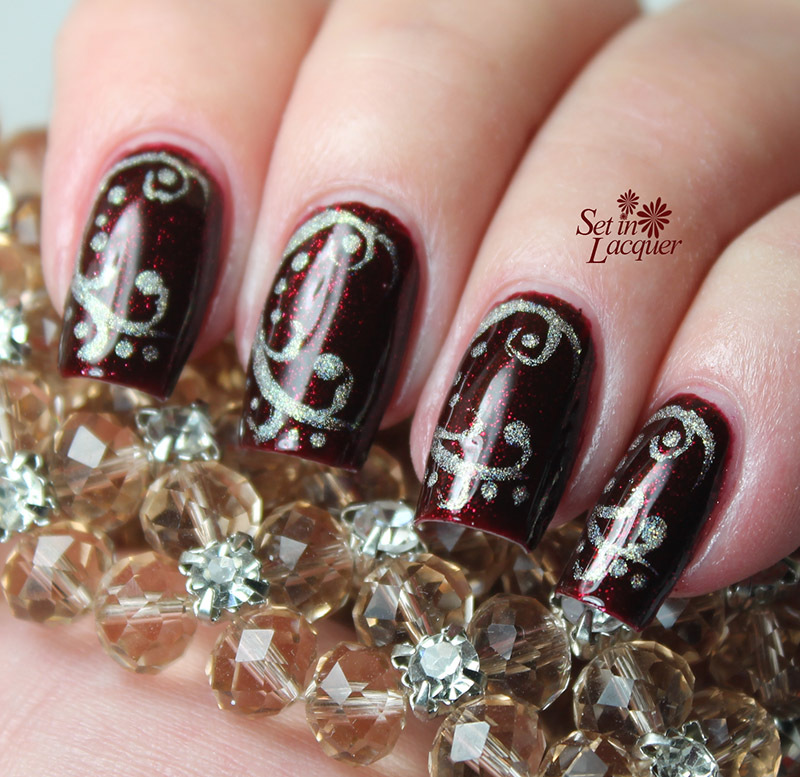 The flakes flash with rich red and gold shades. I applied it over Fancy Gloss My Sailor. I had no application issues with either of these polishes. This is two coats of My Sailor and one coat of Dance Legend 604. 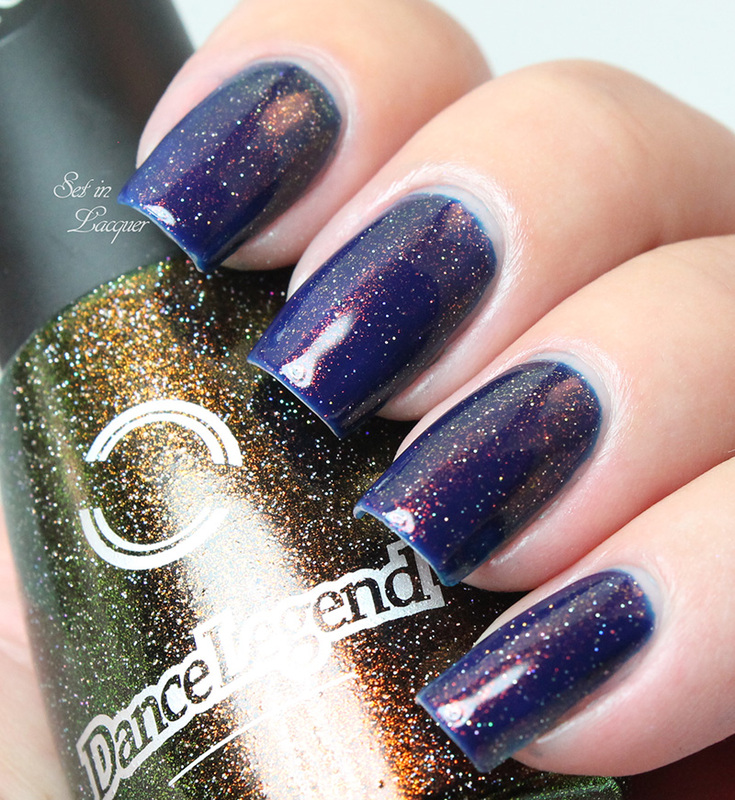 Dance Legend 605 top coat has rich gold micro glitter and tiny holographic particles. The red and gold flakies complement the gold shimmer. I applied it over Fancy Gloss My Sailor. I had no application issues with either of these polishes. This is two coats of My Sailor and one coat of Dance Legend 605. 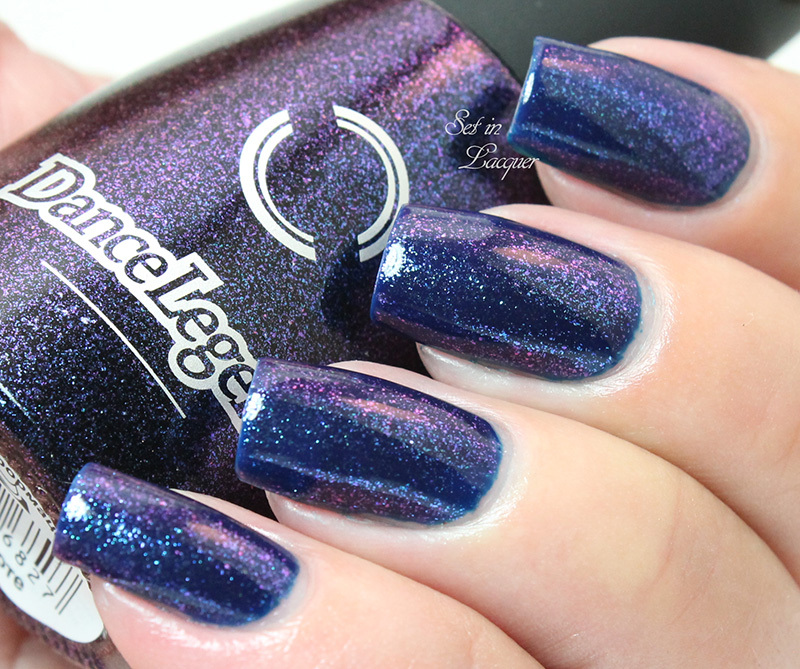 Dance Legend 608 top coat has a stunning blue shimmer to it that becomes almost duo-chrome. 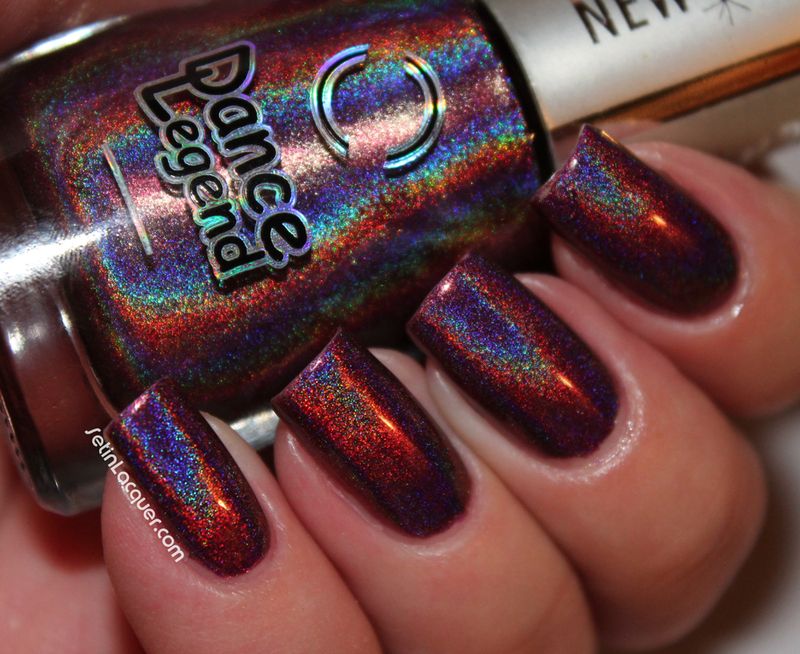 It flashes to purple depending on the angle of your nails. I applied it over Fancy Gloss My Sailor. I had no application issues with either of these polishes. This is two coats of My Sailor and one coat of Dance Legend 608. 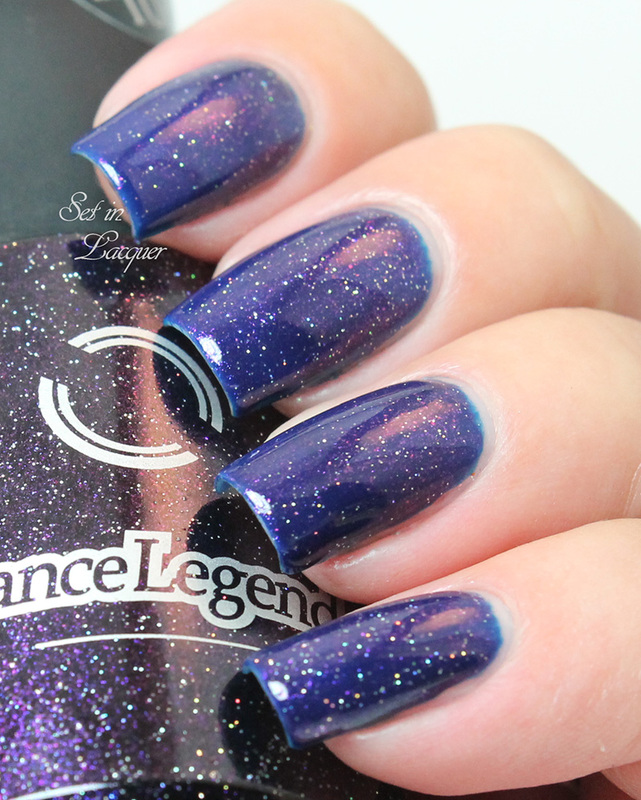 These Dance Legend top coats and Fancy Gloss My Sailor can be purchased at llarowe.com. These polishes were provided to me for an honest review. All opinions are my own. Please note that computer monitors can display colors differently. I am going to start out by showing you three of the top coats. I will be sharing more of these beauties with you these week. 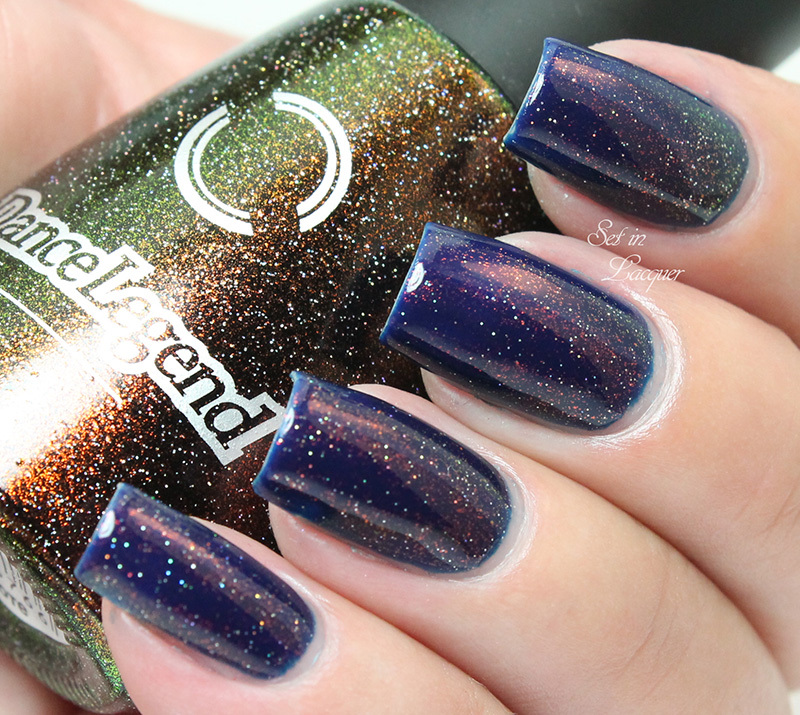 Let's take a look at these mesmerizing, holographic-infused top coats. 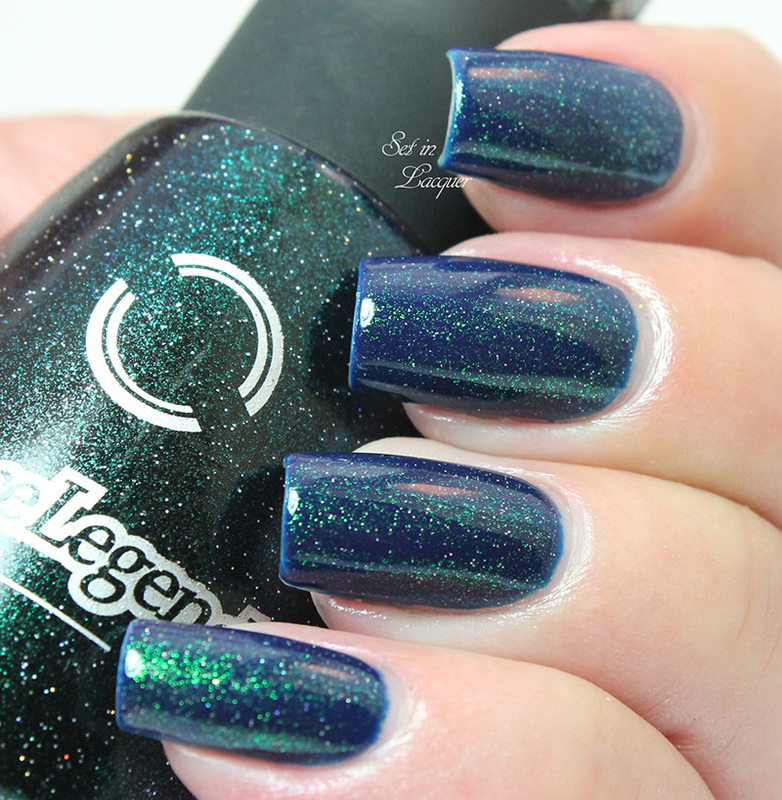 Dance Legend 601 top coat has an amazing array of green and blue holographic shimmer. I applied it over Fancy Gloss My Sailor. 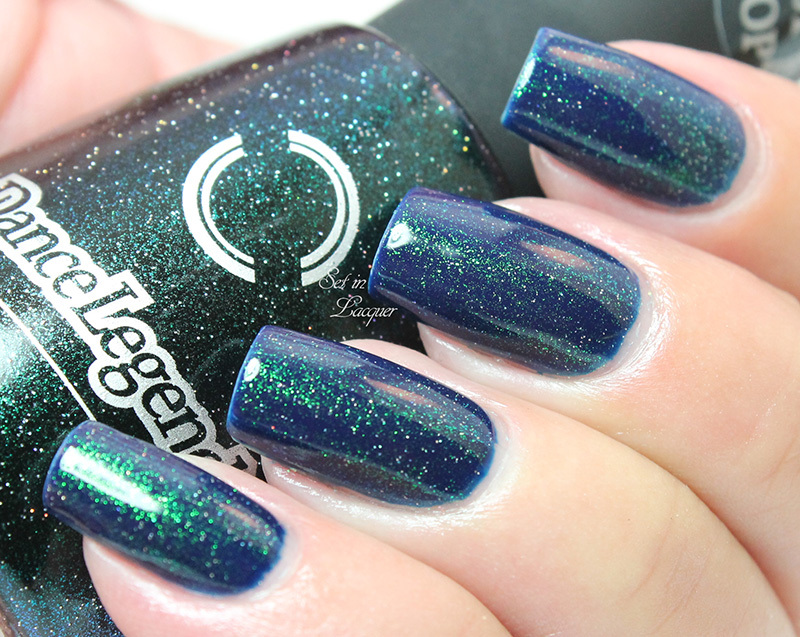 My Sailor is an amazing navy blue creme polish. I had no application issues with either of these polishes. And look at that amazing shimmer! I have always loved this color combination. This is two coats of My Sailor and one coat of Dance Legend 601. 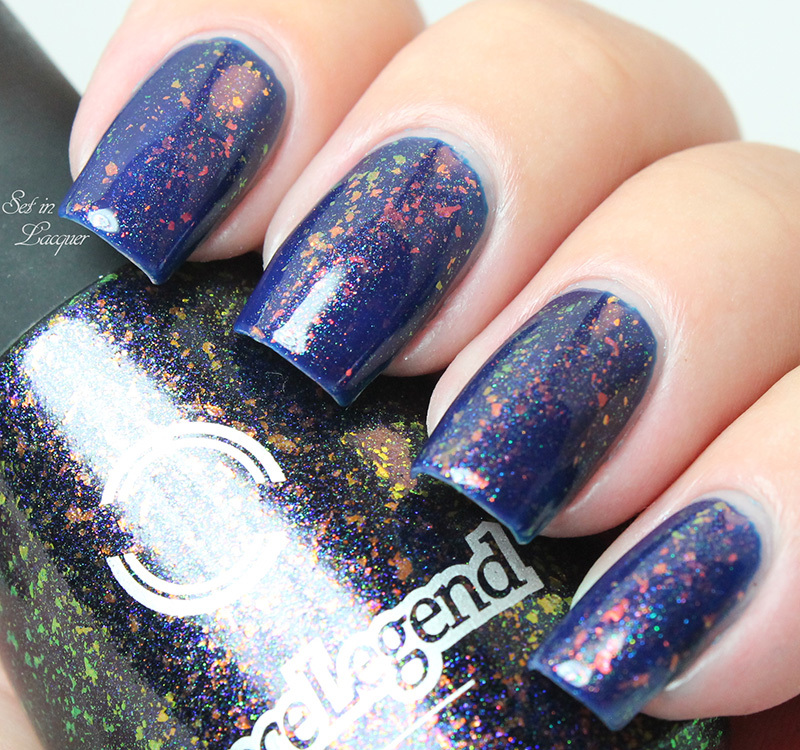 Dance Legend 606 top coat has an amazing array of green and blue holographic shimmer. I applied it over Elevation Tettegouche. 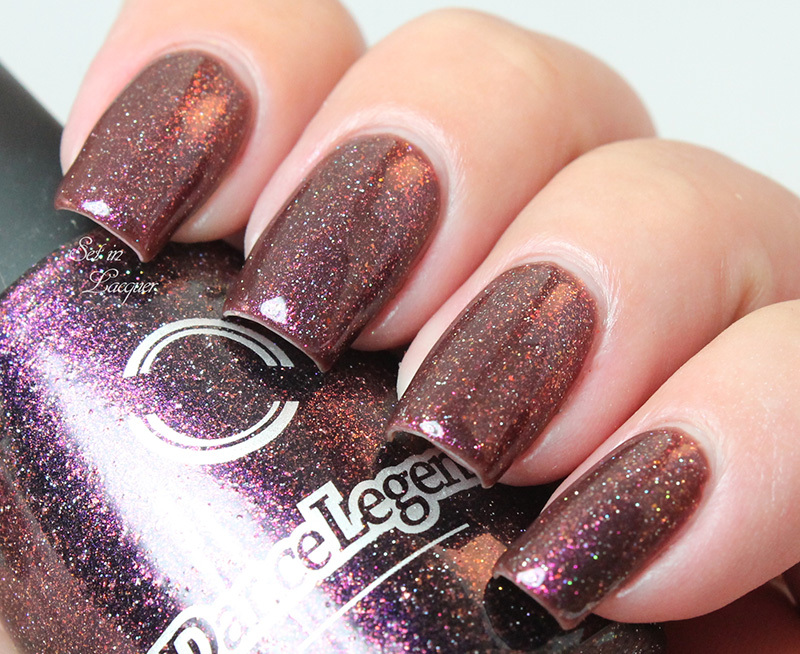 Tettegouche is an stunning chocolate brown creme polish. I had no application issues with either of these polishes. And it certainly adds some stunning shimmer! I have always loved this color combination. This is three coats of Tettegouche and one coat of Dance Legend 606. 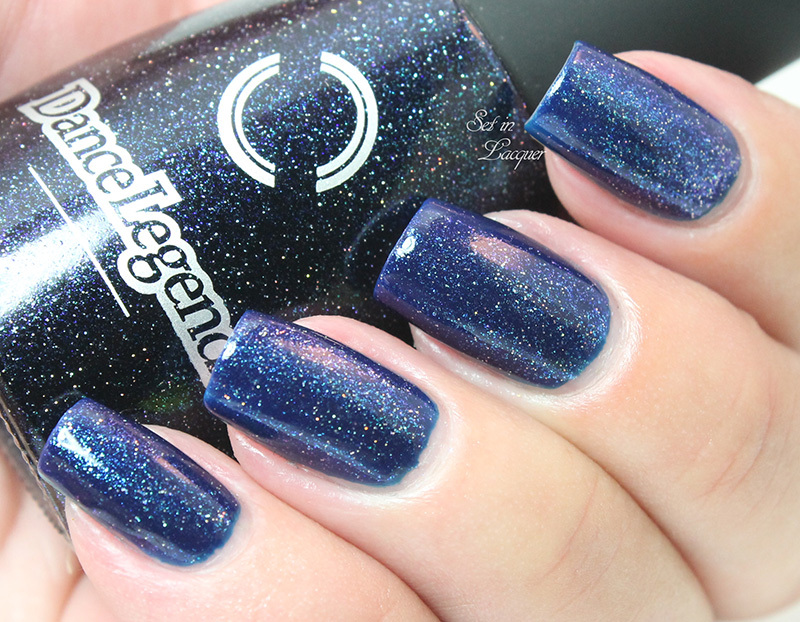 Dance Legend 607 top coat has a primarily blue holographic shimmer. But there is quite the range of colors in that holographic sheen. I applied it over Fancy Gloss My Sailor. 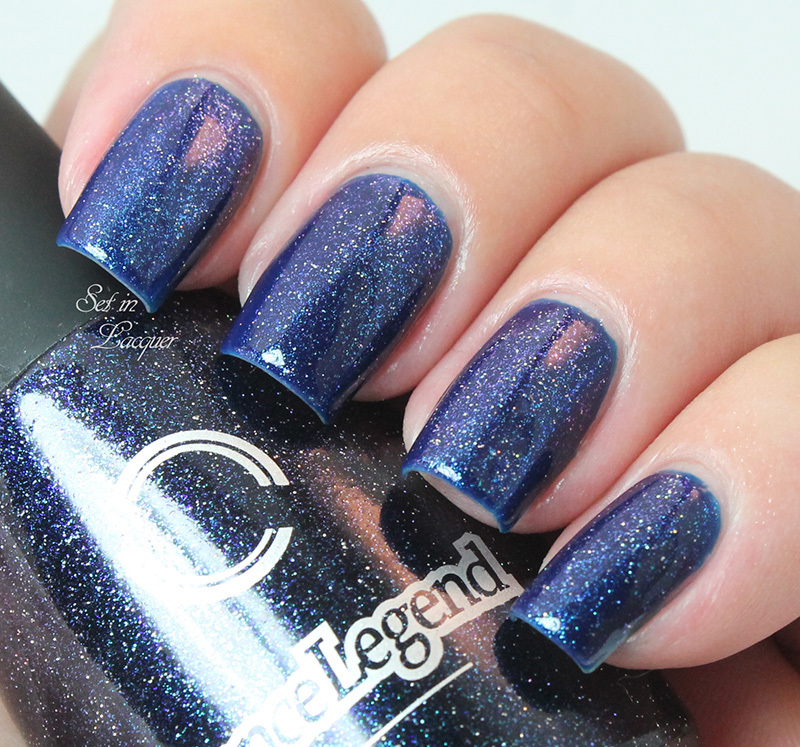 My Sailor is an amazing navy blue creme polish. I had no application issues with either of these polishes. This looks like a starry night sky. This is two coats of My Sailor and one coat of Dance Legend 607. 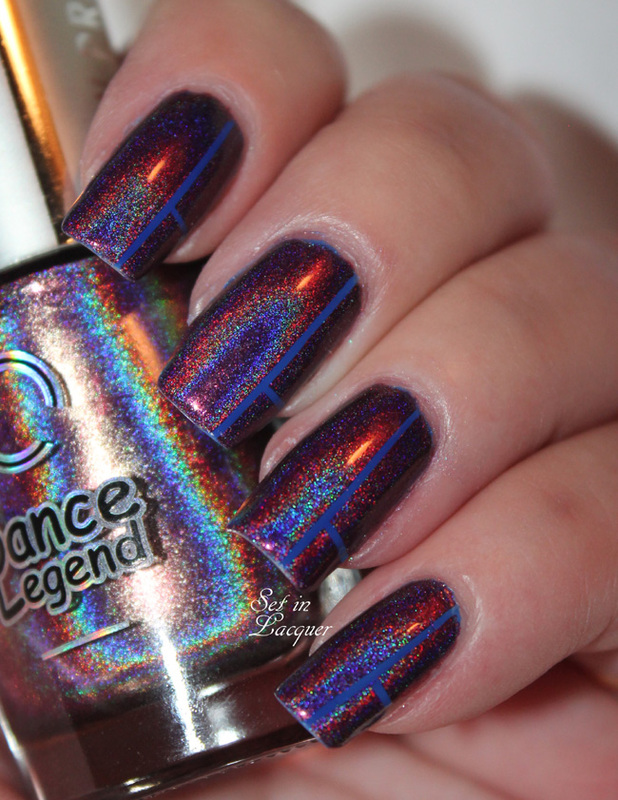 I love holographic nail polish. It is glorious to see in the sunshine, although I haven't seen much of the sun this week. But in the hopes that it would peek its yellow rays out to say "hello," I put on a holo nail polish. 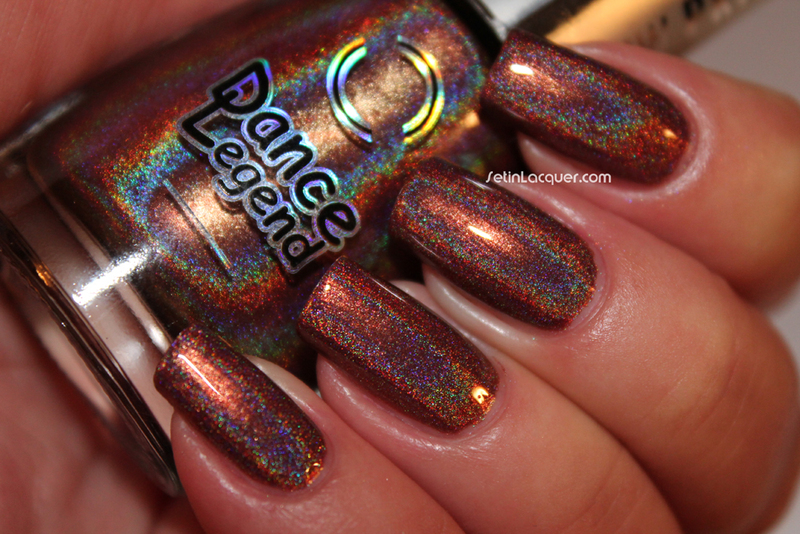 Dance Legend has some of the most amazing holographic polishes out there. I only have a few of them, and I love each and every one of them. For this mani, I wanted something a little beyond just holographic. But not too complicated as I just didn't have the time to invest in nail art. So I created a simple tape mani. For the base coat I used Barielle Blue Capri. Then I used nail art tape in horizontal and vertical placement. 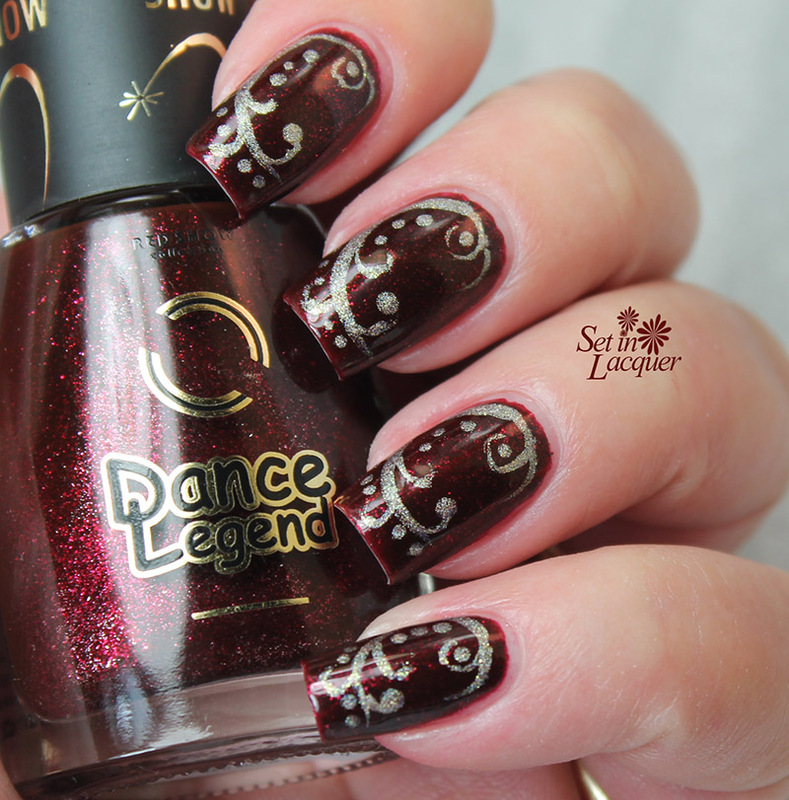 After that, I simply applied Dance Legend Optical Illusion and removed the tape - Instant nail art! 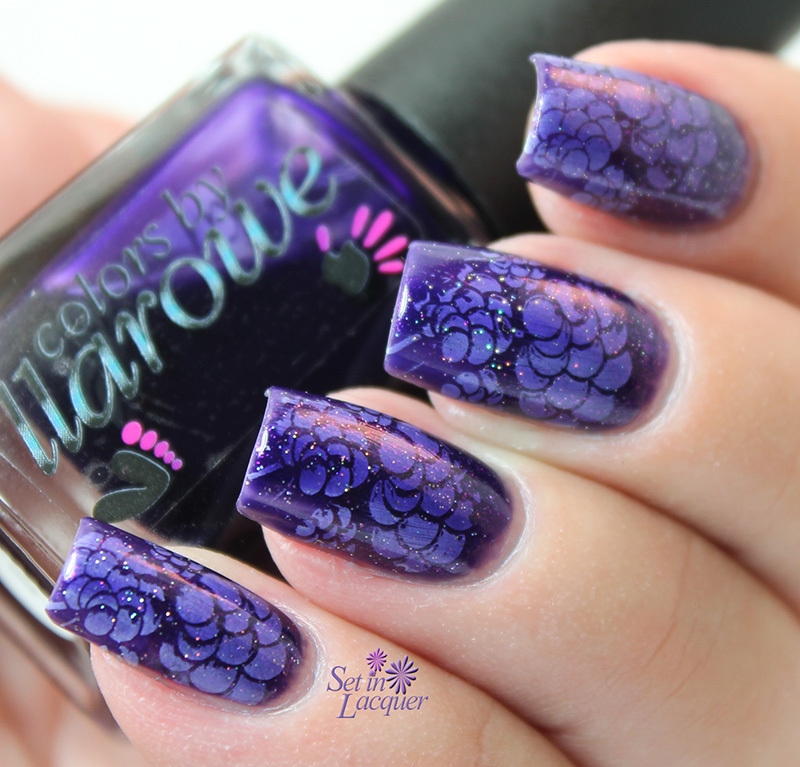 If you love nail art, but don't feel you have the time - try the nail art tape as a template. You will love it! Some polish in this post were previously provided to me for an honest review. All opinions are my own. I had so much fun with the last giveaway that I decided to have another one. 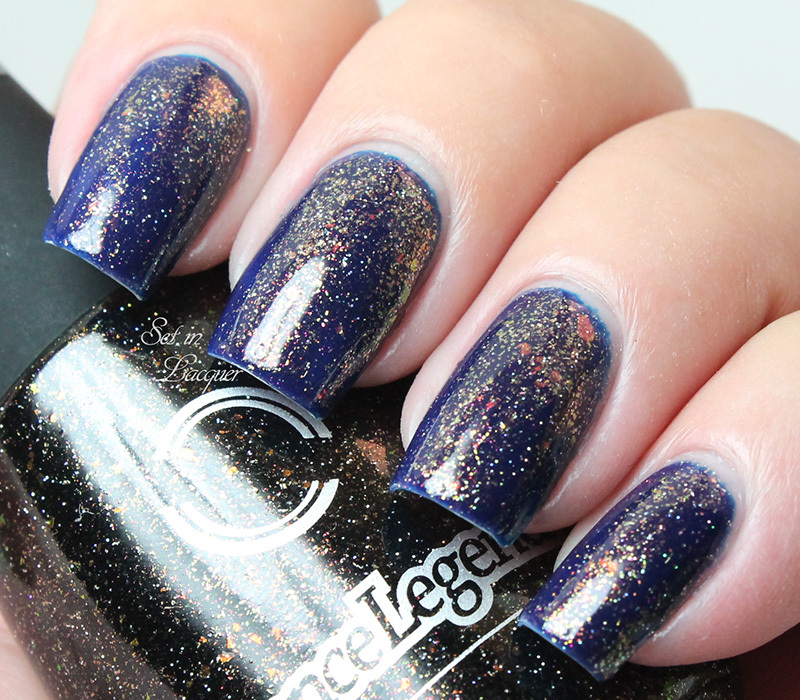 This is the gorgeous polish you could win. This giveaway ends at midnight, Sunday, August 4. To enter simply use the Rafflecopter widget below. 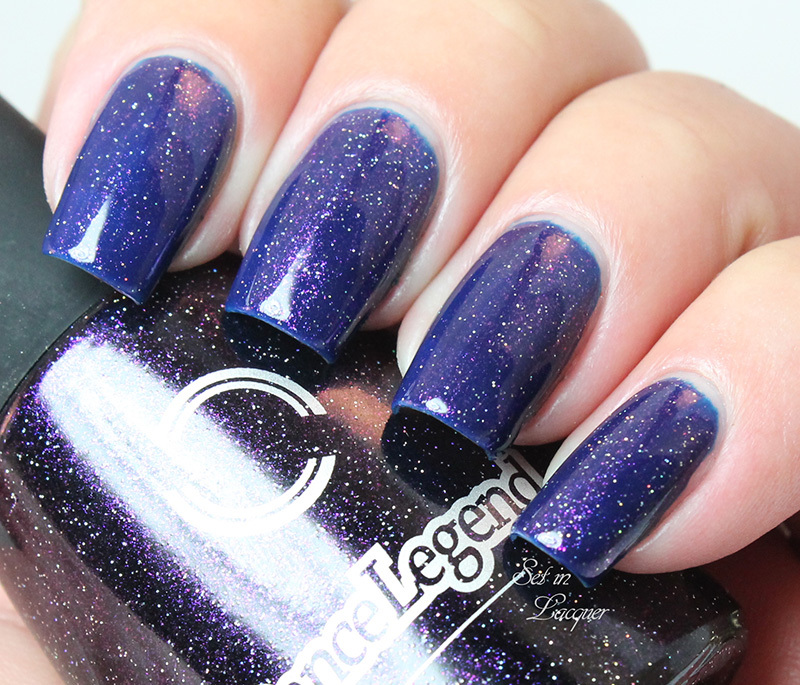 Dance Legends - The name brings to mind graceful dancers and music that gets your toes tapping. That's right in line with the way these polishes are - smooth and graceful. I have swatches of #3, #9 and #10 for you. These polishes are amazing. 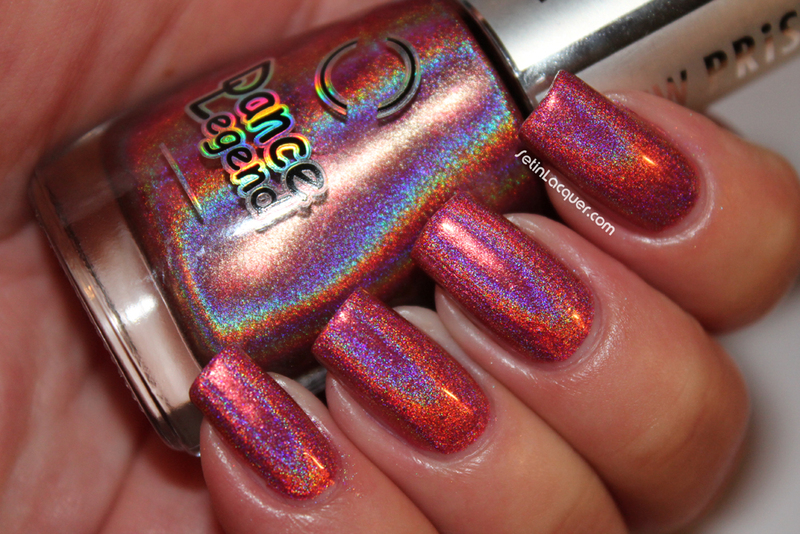 They glide on the nail smoothly and dry to a high gloss shine that is full of holographic goodness. Let's just move straight to the swatches. 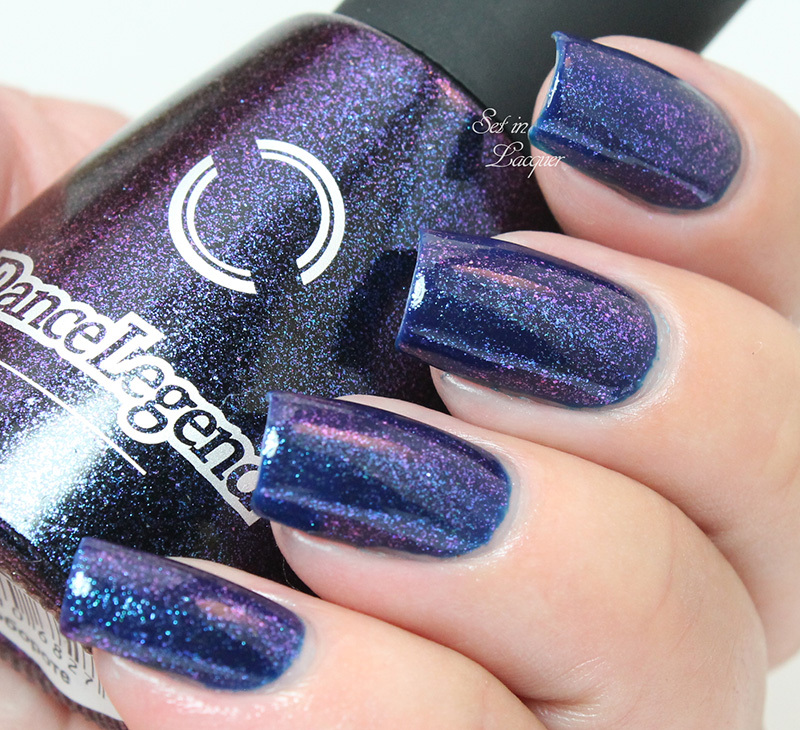 #10 Cosmic Rainbow - is a gorgeous purple with a wonderful holographic sheen. This is two coats. 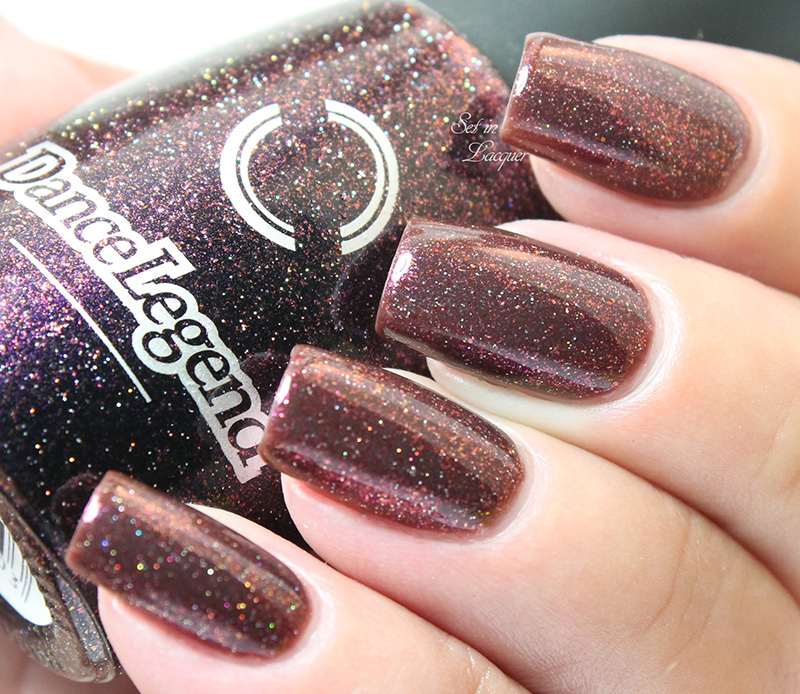 #9 Robots Vs Humans - is a deep rich brown with a vivid holographic sheen. This is two coats. 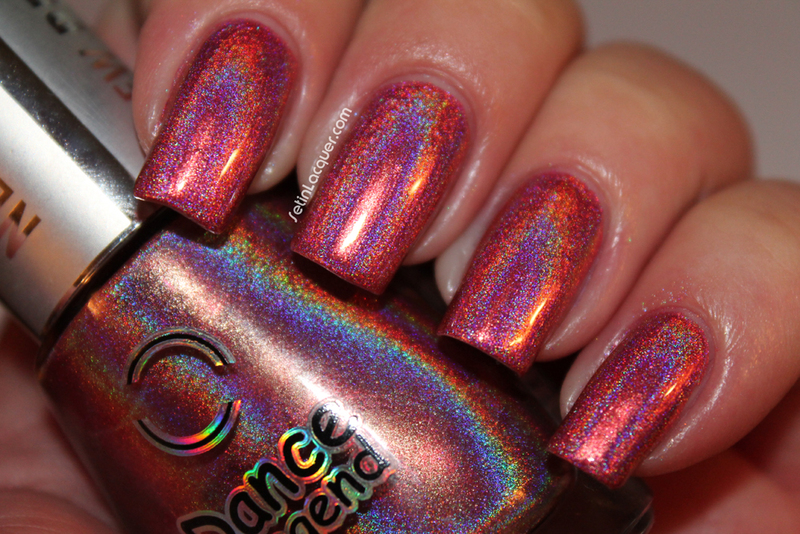 #3 Shock - is a fantastic shade of rose with a brilliant holographic shine. This is two coats. I must get more of these polishes. I seriously think I need them all! See the Dance Legend website to find out where you can order these. They cost about $13. I have an amazing polish to share with you. I recently acquired Dance Legend #4 - Optical Illusion. 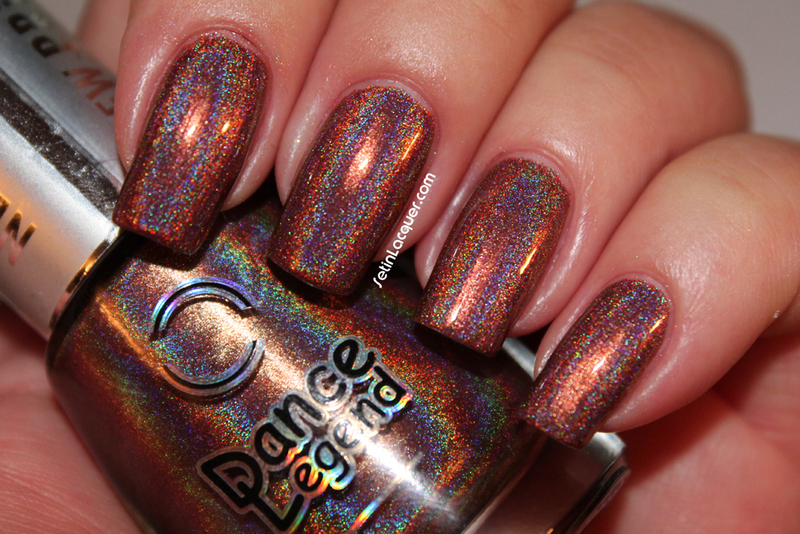 Oh my goodness - this polish is amazing! The linear holo effect is strong; even in indirect light. Dance Legend originates from Russia. The polish applied wonderfully. I do think it has a longer than normal dry time. Even with a top coat of Seche Vite I had to be extremely careful for a bit. Optical Illusion - is a positively stunning deep murky rose shade. It completely dances across your fingernails in the sunlight. I took some photos with a flash, and in normal room lightingI should have taken a photo earlier with the sun was bright. However now the sun has decided to play shy and only peek from behind the clouds. But earlier today (of course I was at work) the sunlight brought multiple prisms out. 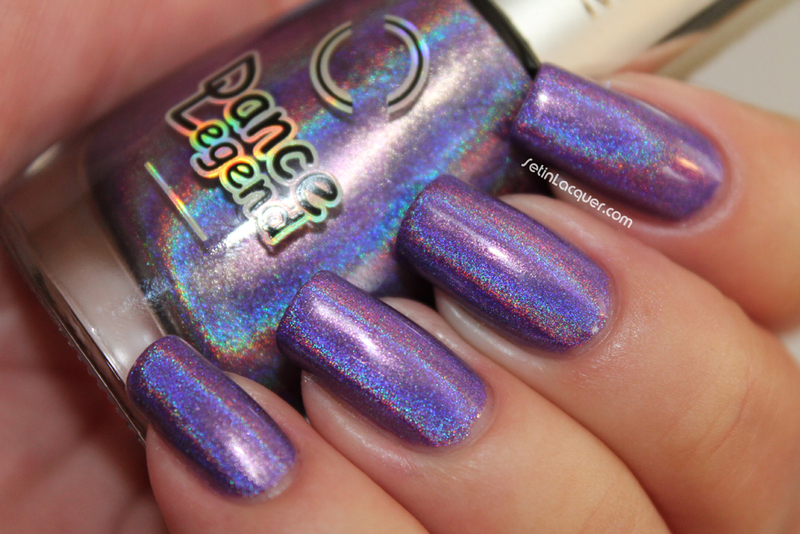 This polish is an eye-catcher and had everyone commenting about it. I must get more of these polishes. You can get these polishes at Llarowe and soon they will be available at Color4Nails. They cost about $13.